The portion of the primary axis of plant which develops from which plumate is called main stem. The axis with leaves is called shoot. Stein has node and internodes. The part of stem from leave arises is called node. The part of stem between two nodes is called internodes. Types of plants on the basis of growth seasons: Plants are divided into three types on the basis of seasonal growth: Annual. Biennials and Perennials. I. Annuals: The, plants which live only for single growing season are called annuals. They die after this season. Most herbaceous plants are annuals like tomato, wheat, rice etc. Biennials: The plants which live for two growing seasons are called biennials. They develop leaves on short stem in first growing season. They store food in their tuberous tap roots. The leaves die away at the end of the growing season (in winter). They use this stored food to develop flowers and fruits in the second growing season (after winter). Examples: radish, turnip, carrot. Perennials: The plants which live for several years are called perennials, All woody plants are perennials. 1.Herb: An annual green small sized plant is called herb. They have son and usually green stem. e.g. radish. 3.Tree: It is perennial green woody plant with a distinct upright (straight) stem of 6 feet or more is called tree. Example mango. Following descriptive terms are used for stem. Herbaceous steni: Soft and green stem that can be easily bent is called herbaceous stern. Woody stem: Hard woody stem which cannot be easily bent is called wood stem. Fistular: If the internodes of the plants are hollow, then the stern is called fistular. Example: bamboo. Solid: If stem is not hollow at internodes then it is called solid: Jointed: The stems swollen at internodes are called jointed. Example: stems of grasses. Hairy: The stem having hair on its surface is called hairy. Example: sunflower. I.Reduced aerial stem: In this case, stem is very reduced and present in the form of green structure above the thick roots. 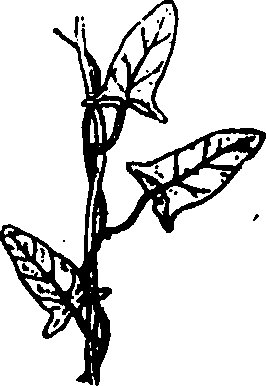 These stems are so–small, that the leaves appear to be arised from root directly. Example: stem of radish, turnip etc. 2.Erect stem: In this case, stem is thick and strong. It grows upward. Such stems are present in trees. 3.Weak stems: These stems are much weak. They are unable to grow erect. Therefore, they become climber or spread on the ground. 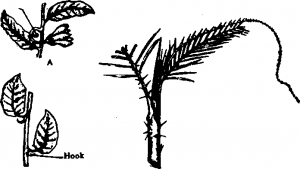 Plants are divided into different groups on the basis of structure of their weak stems. Tendril climbers: These plants develop long slender tendrils for climbing up in the support. The tendril may be modified stem or leaves. It is very sensitive to support. As soon as it touch some support. 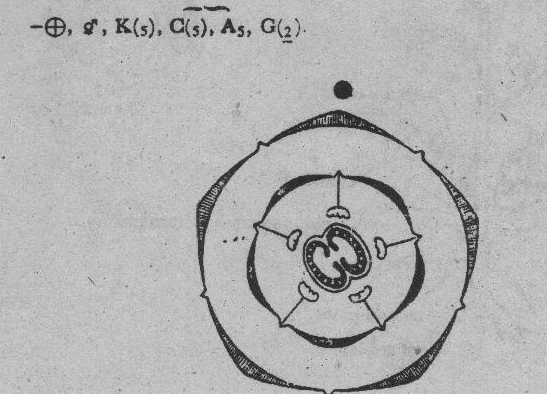 It coils around it. Example: melons, cucumbers etc. 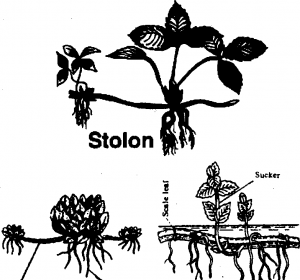 Root climbers: These plants attach to the support by means of small adventitious roots. Example: pepper. Sucker: Sucker is an underground runner or shoots. It arises from an axillary bud develop on the underground stern. It grows upward and gives rise to aerial branches. 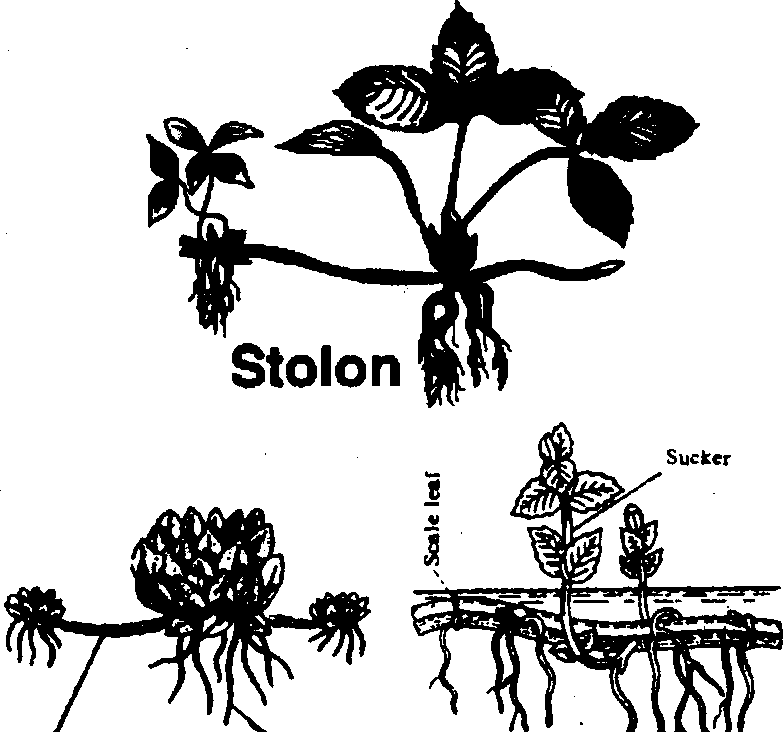 It gives off adventitious roots into soil. Thus a new plant is formed. These stems grow underground. They are often thick and swollen with a large amount of stored food. Underground stems are formed in perennial herbs. The underground sterns resemble roots. But these stems have nodes and intemodes or scale leaves. They always arise from the axils of leaves. There are different types of underground stems. 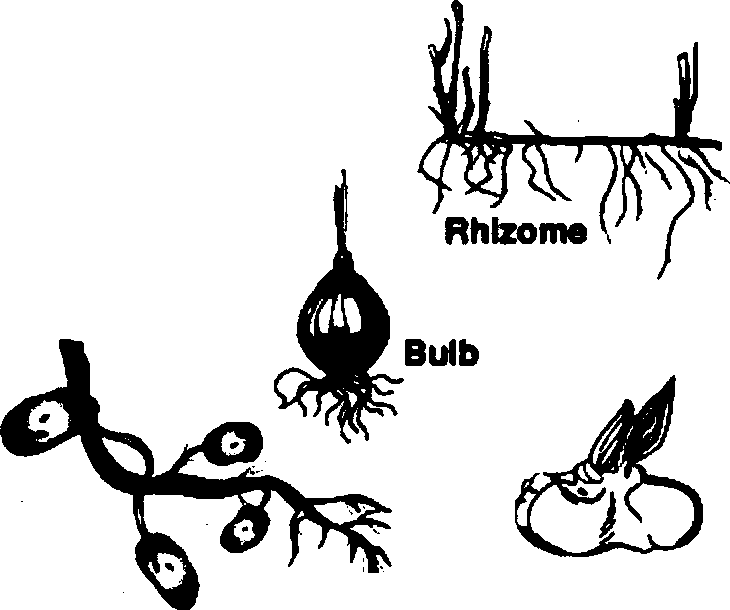 These are rhizome. corm. bulb and stem tubers. 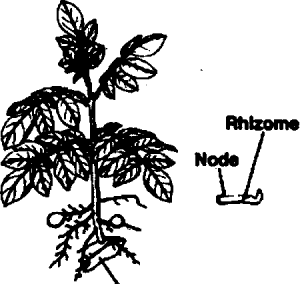 (a) Straggling rhizome: The elongated less branched rhizome which grows horizontally is called straggling rhizome. It is found in water grasses (typha). 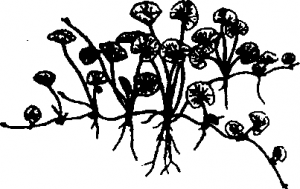 (b) Sobole rhizome: In this case, the rhizome is long, slender and has long ‘memories. Such ‘rhizomes are called sobole rhizomes. These are found in many grasses. (c)Monpodial rhizome: They are arranged like racemose. They have single axis v,hich give rise to lateral branches. It is found in wood sorrel (Oxalis). 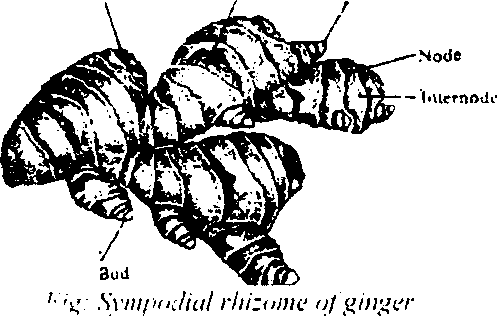 (d) Sympodial rhizome: In this case, the rhizomes are arranged in cymose pattern. In this case, each branch give rises to new axis. It is found in ginger. 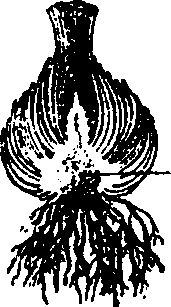 composed of many small oval structures called cloves. 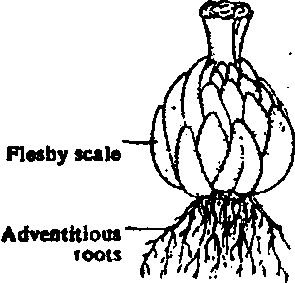 There is central clove (apical .bud) surround by peripheral cloves (lateral buds). The cloves are arranged spirally. 4. Stem tubers: The swollen Underground tips of branches of vertical axis which store food and use for vegetative propagation is called stem tuber. It is found in potato. In potato plant, several slender axillan branches arise from the basal under ground portion of the stem. These branches bear thliage leaves. These leaves prepare food. This food is stored up in the tips of underground branches to form tubers. 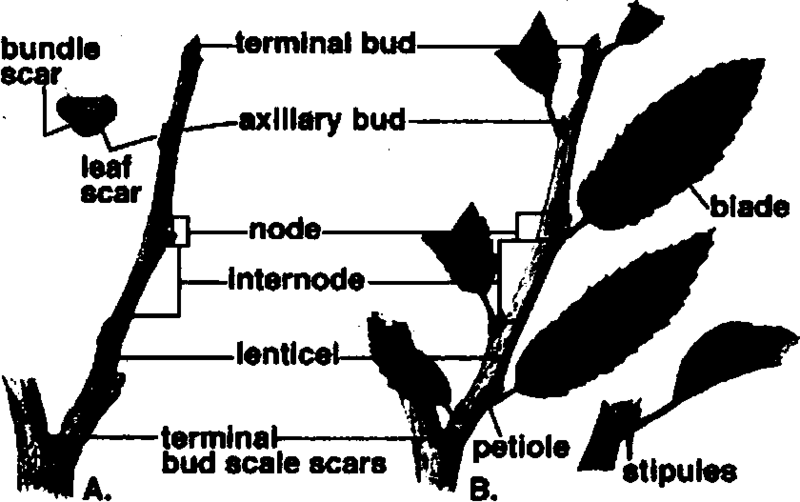 Potato tuber consists of several nodes and intemodes. 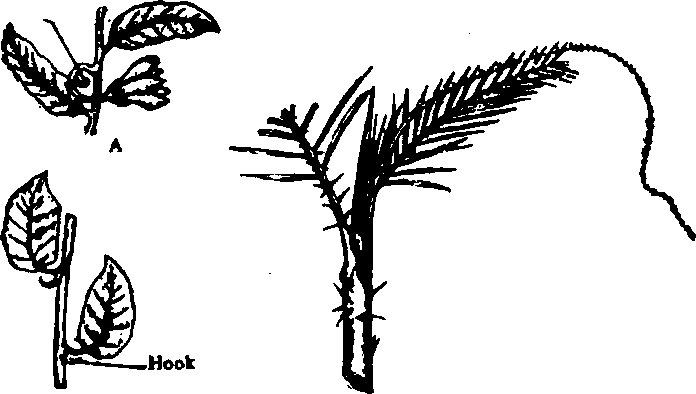 There are groups of lateral buds in the axil of scale leaves. These groups of buds are called eyes. The eyes represent the nodes..fhe eyes are arranged spirally. The plant of potato dies in the autumn. 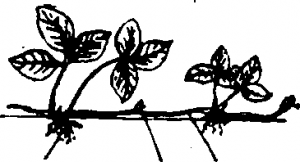 Therefore, tubers detach from the plant. Their buds grow in the coming spring togive rise to new plant. unfavourable conditions for growth is perennation. The underground stems are means of :getative reproduction. It increases the number of plants rapidly in . : locality. They have large amount of storage food. ‘his food is consumed by newly growing plant in growing season. Most of the undervound steins have a large amount of stored food in the form starch. It is used by human being. Some underground stems are used as medicinal plants. For example, garlic is used to decrease cholesterol in the body. Undergrounds stem especially rhizome cause serious problems in agriculture. Some weeds develop underground rhizomes. These rhizomes arc cut into piece during ploughing. Each piece develop new weed in the new crop. In this way, it becomes very difficult to control such w eeds. Some stems are highly modified. They even do not look like stems. I. Stem tendrils: These are slender thread like structures. The> are highly specialized climbing organs. 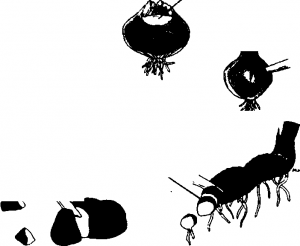 they are found in climbing plants like vines. T he arc sensitise to contact. They tw ins around an support. 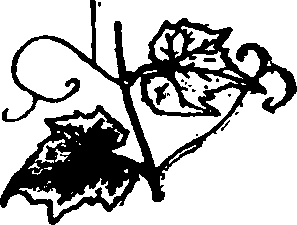 Phylloclade and Cladode: In some dry plants, true leaves are reduced to scales. It presents transpiration. Their stems become flattened. green and leaf like. They perform the fimetion of leaf. Such leases like steins are called phylloclade and cladode. 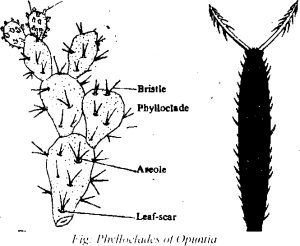 Phylloclades are composed of more than one internode. 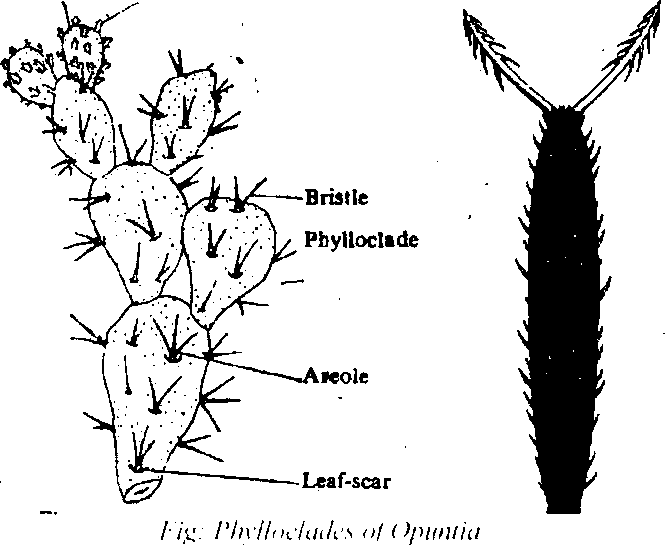 They are found in Opuntia. Cladodes are composed of single internode. They are found in cuphorbia. Phylloclades and cladodes are used to store a large amount of water. They also carry out the function. of Ibliage leases. .1hey help plants to conserve water supply. 4.Thalamus or torus: ‘lite enlarge till of the stalk of flower is called thalamus. It bears floral leaves like sepals, petals etc. These floral leaves arc modified thliage leaves. Stem hear leaves, flowers and Fruits. Stem espose them to sunlight. Stem condtkit water mk.I dissol ed suI)stanees. Some stems like tubers. rhit nines corm store lood. In some cases the) scr‘ e the htin intl ol leases like Pk Iloclades ;Ind cladodcs. 5.In some eases stem arc tt for climbing like tendrils. .Sterns in the lorrn oh thorns protect the plants From Ula/Illg animak. the information given above is very infrmative….touched relevent points.it helped fa ma seminar preparation.i got basic idea to initiate.